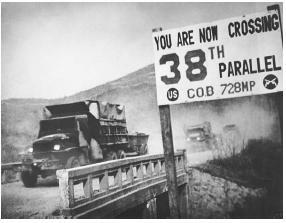 A convoy of U.S. Army trucks cross the 38th parallel during the Korean War. The parallel marks the dividing line between North and South Korea. The Korean War was a conflict fought on the Korean Peninsula from June 1950 to July 1953. Initially the war was between South Korea (Republic of Korea) and North Korea (Democratic People's Republic of Korea), but it soon developed into an international war involving the United States and 19 other nations. The United States sent troops to South Korea as part of a United Nations "police action," which sought to repel the Communist aggression of North Korea. Before the war ended in a stalemate, the People's Republic of China had intervened militarily on the side of North Korea, and the Soviet Union had supplied military equipment to the North. At the end of World War II, in 1945, the Soviet Union occupied the Korean Peninsula north of the thirty-eighth degree of latitude, while the U.S. occupied the territory south of it. In 1947, after the United States and the Soviet Union failed to negotiate a reunification of the two separate Korean states, the United States asked the U.N. to solve the problem. The Soviet Union, however, refused a U.N. proposal for a general election in the two Koreas to resolve the issue and encouraged the establishment of a Communist regime under the leadership of Kim Il-sung. South Korea then established a democratic government under the leadership of Syngman Rhee. By 1949, most Soviet and U.S. troops had been withdrawn from the Korean Peninsula. On June 25, 1950, North Korea, with the tacit approval of the Soviet Union, launched an attack across the thirty-eighth parallel. The U.N. Security Council passed a resolution calling for the assistance of all U.N. members to stop the invasion. Normally, the Soviet Union would have vetoed this resolution, but it was boycotting the Security Council in protest of the U.N.'s decision not to admit the People's Republic of China. Sixteen nations joined the U.N. forces, including the United States. President Harry S. Truman immediately responded by ordering U.S. forces to assist South Korea. Truman did so without a declaration of war, which until that time had been a prerequisite for U.S. military involvement overseas. Though some Americans criticized Truman for this decision, generally the country supported his action as part of his strategy of "containment," which sought to prevent the spread of Communism beyond its current borders. Korea became the Test Case for containment. The North Korean forces crushed the South Korean army, with the South Koreans holding just the southeastern part of the peninsula. U.N. forces, under the command of General Douglas MacArthur, stabilized the front. On September 15, 1950, MacArthur made a bold amphibious landing at Inchon, about one hundred miles below the thirty-eighth parallel, cutting off the North Korean forces. The North Korean army was quickly crushed, and more than 125,000 soldiers were captured. MacArthur then sent U.N. forces into North Korea, proclaiming, on November 24, that the troops would be home by Christmas. As U.N. forces neared the Yalu River, which is the border between North Korea and Manchuria, the northeast part of China, the Chinese army attacked them with 180,000 troops. The entrance of China changed the balance of forces. U.S. troops took heavy casualties during the winter of 1950–51 as the Chinese army pushed the U.N. forces back across the thirty-eighth parallel and proceeded south. U.N. forces finally halted the offensive south of Seoul, the capital of South Korea. A U.N. counteroffensive in February 1951 forced the Chinese to withdraw from South Korea. By the end of April, U.N. forces occupied positions slightly north of the thirty-eighth parallel. It was during this period that President Truman became concerned about the actions of MacArthur. The general publicly expressed his desire to attack Manchuria, blockade the Chinese coast, and reinforce U.N. forces with troops from Nationalist China, with the goal of achieving victory. Truman, however, favored a limited war, fearing that MacArthur's course would bring the Soviet Union into the war against the United States. When MacArthur continued to make his views known, Truman, as commander in chief, relieved the general of his command on April 11, 1951. The "firing" of MacArthur touched off a firestorm of criticism by Congress and the public against Truman and his apparent unwillingness to win the war. Nevertheless, Truman maintained the limited war strategy, which resulted in a deadlock along the thirty-eighth parallel. In June 1951, the Soviet Union proposed that cease-fire discussions begin, and in July the representatives of the U.N. and Communist commands began truce negotiations at Kaesong, North Korea. These negotiations were later moved to P'anmunjom. The Korean War affected U.S. domestic policy. In April 1952, President Truman sparked a constitutional crisis when he seized the U.S. steel industry. With a labor strike by the steelworkers' union imminent, Truman was concerned that the loss of steel production would hurt the Korean War effort. He ordered Secretary of Commerce Charles Sawyer to seize the steel mills and maintain full production. The steel industry challenged the order, bringing it before the Supreme Court. In youngstown sheet and tube co. v. sawyer, 343 U.S. 579, 72 S. Ct. 863, 96 L. Ed. 1153 (1952), the Court refused to allow the government to seize and operate the steel mills. The majority rejected Truman's claim of inherent executive power in the Constitution to protect the public interest in times of crisis. Truman's popularity declined because of the war, which contributed to his decision not to run for reelection in 1952. In the presidential race, Republican dwight d. eisenhower easily defeated Democrat adlai stevenson. Eisenhower, a former U.S. Army general and World War II hero, pledged to end the war. The truce negotiations, which broke off in October 1952, were resumed in April 1953. After Eisenhower hinted that he was prepared to use Nuclear Weapons if a settlement was not reached, an Armistice was signed on July 27, 1953. More than 33,000 U.S. soldiers died in the conflict, and 415,000 South Korean soldiers were killed. It is estimated that 2,000,000 North Koreans and Chinese died. The United States has maintained a military presence in South Korea since the end of the war, because North Korea and South Korea have remained hostile neighbors. Harrison, Selig. 2002. Korean Endgame: A Strategy for Reunification and U.S. Disengagement. Princeton, N.J.: Princeton Univ. Press. Isserman, Maurice. 2003. Korean War: Updated Edition. New York: Facts on File. Levie, Howard S. 2002. "How it All Started—And How it Ended: A Legal Study of the Korean War." Akron Law Review 35 (winter): 205–25. Turner, Robert F. 1996. "Truman, Korea, and the Constitution: Debunking the 'Imperial President' Myth." Harvard Journal of Law & Public Policy 19 (winter): 533–5. Young, James V., and William Stueck. 2003. Eye on Korea: An Insider Account of Korea-American Relations. College Station: Texas A&M Univ. Press. Cold War; Labor Law; Labor Union; Presidential Powers; Stalin, Joseph; Vietnam War. It attempts to cover too many aspects of the Korean War in too few pages. With this outpouring of new scholarship it has now become almost axiomatic to view the Korean War as a pivotal turning point in modern Korean history. A peace treaty ending the Korean war has never been signed. The Barker brothers' father, Mr Edward L Barker, of Crockett, Texas, was a Marine Corps helicopter pilot and Korean War hero. His treatment of communist politics is much more problematic, particularly his analysis of the relations between Stalin and Mao, where he accepts rather uncritically the strained interpretations presented in Uncertain Partners: Stalin, Mao and the Korean War by Sergei Goncharov, John W.
Sutker and her co-workers compared the current mental status of 22 POWs and 22 combat veterans of the Korean War. The Korean War is still much remembered by those Americans who fought in it. It is imperative that the Veterans from all services who served in the Korean War are recognized and remembered for their service and sacrifice," said Colonel David J. This year, the ministry joined hands with the embassy to express gratitude to Korean War veterans dispatched to Korea during the 1950-53 Korean War. Korean Canadian Senator Yonah Martin works tirelessly on behalf of Canada's Korean War veterans. Appendices list US Navy carrier deployments in the Korean War, US Navy aircraft lost in the Korean War, and aircraft shot down by Navy pilots in the war. Summary: TEHRAN (FNA)- North Korea vowed Tuesday to cancel the 1953 cease-fire that ended the Korean War, citing a US-led push for punishing UN sanctions over its recent nuclear test and ongoing US-South Korean joint military drills.